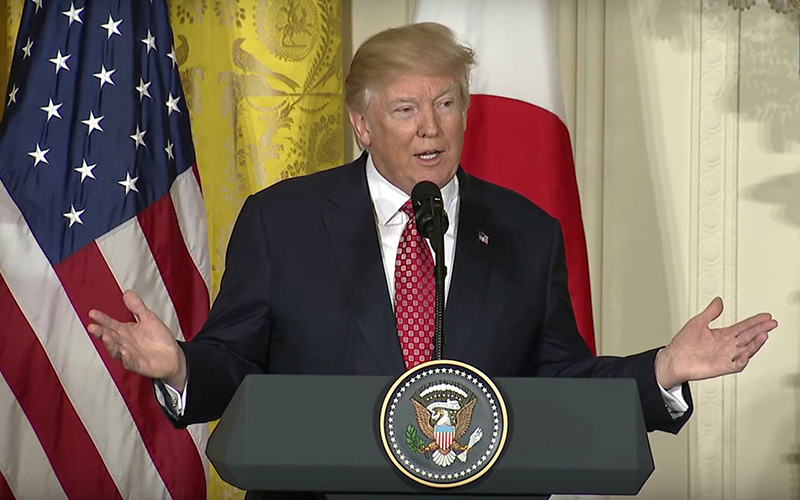 WASHINGTON – President Donald Trump vowed Friday to continue to fight for his travel ban, just hours after losing a second court battle over his order temporarily freezing admission of refugees and of all visitors from seven majority-Muslim nations. Trump – who tweeted “SEE YOU IN COURT” minutes after a federal appeals court refused to lift an injunction on his order Thursday evening – said at a White House event Friday that he planned to “continue through the court process,” he did not specify how or when that action might come. 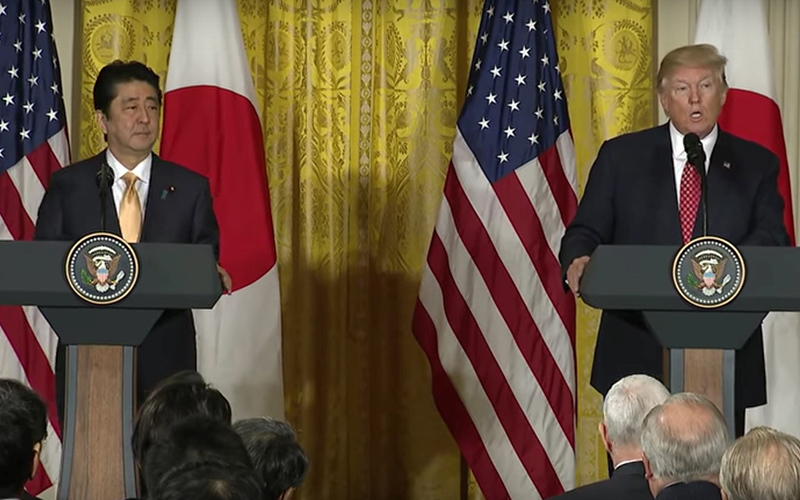 During a meeting with Japanese Prime Minister Shinzo Abe, Trump said he has “no doubt that we’ll win that particular case,” pledging to “do whatever is necessary to keep our country safe” against what he called tremendous threats. But critics of the ban hailed Thursday’s ruling by a panel of the 9th U.S. Circuit Court of Appeals. Many were like Rep. Ruben Gallego, D-Phoenix, who called the ban “illegal and un-American” and claimed that it plays into the hands of terrorist groups like the Islamic State. “Trump’s bigoted policy blocks local interpreters who help our troops fight terrorists in the Middle East from (receiving) asylum, making it more dangerous for them to assist our military,” Gallego said in a statement. “By creating additional risks for people who fight alongside our troops, Trump is putting the lives of our servicemen and women in danger. I applaud yesterday’s court decision,” he said Friday. That decision upheld a Feb. 3 ruling by federal district court judge in Washington state who issued a temporary restraining order to block enforcement of the travel ban until a legal challenge by the states of Washington and Minnesota could be heard. The Trump administration asked for an emergency stay of that order, which the 9th Circuit initially denied on Saturday and formally denied Thursday in a 29-page order. There were three main parts to the order, all designed to give the government time to review its process for vetting immigrants, to make sure terrorists cannot slip in. The order imposed a 120-day suspension of the admission of any refugees to the U.S., an indefinite suspension of the admission of refugees from Syria and a 90-day suspension of entry to all visitors from seven targeted countries. Those countries – Iran, Iraq, Libya, Somalia, Sudan, Syria and Yemen – are all majority-Muslim nations, sparking charges of religious discrimination by critics, charges the White House vehemently denies. There were several legal challenges, but the suit by Washington and Minnesota was the first to bring a national halt to the ban. The states called the order unconstitutional and immoral and said it would cause them irreparable harm, mainly by turning away scholars and students that the states’ universities rely on. The states said the order was not meant to prevent terrorist attacks, but rather to “enact a ‘Muslim ban’ as the President had stated during his presidential campaign,” court documents said. But a three-judge panel of the appeals court was having none of it. “The Government has taken the position that the President’s decisions about immigration policy, particularly when motivated by national security concerns, are unreviewable, even if those actions potentially contravene constitutional rights and protections,” said the unanimous panel decision. But the government’s claim that even reviewing an executive action would violate the separation of powers “runs contrary to the fundamental structure of our constitutional democracy,” the panel said, pointing to the checks and balances built into the government. The panel did not decide the merits of the case – including the so-called Muslim ban – only ruling on whether to leave the restraining order in place until that challenge is heard. It said there was enough evidence of potential harm to the states, and the likelihood that their case might succeed, to let the injunction stay for now. It gave the parties until late March to file briefs for that challenge. That schedule could change, however, if the administration asks for a Supreme Court review. And the circuit court said Friday that one judge has asked for a full-court review of the panel’s Thursday decision. If granted, that could expedite the schedule. Repeated requests Thursday and Friday for comment from members of Arizona’s congressional delegation were not returned. In previous statements, however, some backed the president. Rep. Trent Franks, R-Glendale, said when the order was signed that it would allow immigrants “who respect and share our values” to legally find refuge here. But immigrant-rights group Promise Arizona sided with Gallego and the states.